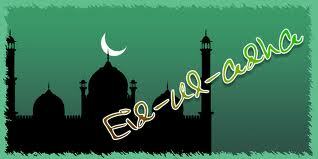 Id-ul-Zuha, Idul-Adha or Bakri id, the festival of sacrifice is observed by Muslims all over India as well as the world. 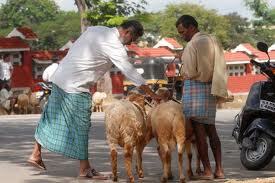 In Arab and other Muslim countries it is celebrated as the Id-ul-Zuha where as in India it is celebrated as Bakri id. This festival is celebrated to memorialize the sacrifice of Hazrat Ibrahim, who voluntarily killed his son at God’s command. According to Islamic mythology, Ibrahim was commanded by Allah(God)to propitiate him by sacrificing his son Ismail. At first he willingly agreed to do so to gratify God but was unable to repress his fatherly feelings. So he covered his eyes with a dark cloth before placing Ismail on the altar at the mount Mina near Mecca. After the ritual-killing of his son, when he removed the cover from his eyes, astonishingly he found that his son was alive and instead a butchered lamb lay on the altar. 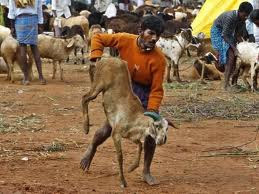 To celebrate this event, Muslims sacrifice one animal, e.g. 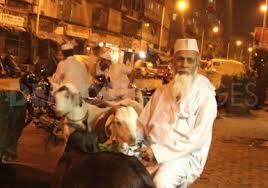 a bakr or goat for each family or a group of families. The sacrifice is followed by prayers at mosques, grand feasts and merry-making. The Muslims wear new garments, visit each other’s places and exchange good wishes. The Bakri id is observed on the tenth day of Dhul-Hagg, the last month of the the lunar year. The dawn of Bakri id in Kerala and other parts of the world reverberates with the sound of Thakhir (Allahu Akbar), asserting that the God is great. Everybody in the Muslim community recites the Thakbir after draping themselves in white. Then they gather for public prayers in an open wide place- Id-Gah, which is a wide-open space. With the ending of the Id prayer, the leader delivers religious lectures to the devotees. Finally the gathered masses hugs each other warmly thus expressing loving brotherhood. In Kerala, Bakri id is celebrated particularly as the occasion for confluence of the notable members of sister communities. In this way the relation of brotherhood as well as friendly communal relations is maintained amongst the members of various communities and the Keralites. After the celebration of Idul Azha or Bakri id the famous Haj is performed.